Nutrition information per serving (1/6 of recipe). This recipe is an excellent source of protein, niacin, vitamin B6, vitamin B12, iron, selenium and zinc; and a good source of fiber. 1. 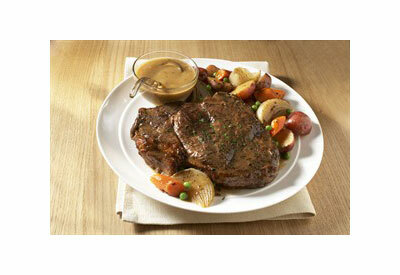 Combine seasoning ingredients; press evenly onto all surfaces of beef roast. Heat oil in stockpot over medium heat until hot. Place roast in stockpot; brown evenly. Pour off drippings. Season with salt and pepper. 2. Add broth to stockpot; bring to a boil. Reduce heat; cover tightly and simmer 2-1/4 hours. Add potatoes, carrots and onion to stockpot; bring to a boil. Reduce heat; continue simmering, covered, 25 to 30 minutes or until roast and vegetables are fork-tender. Stir in peas; simmer 5 minutes. 3. Remove roast and vegetables; keep warm. Skim fat from cooking liquid, if necessary. Measure 1-1/2 cups cooking liquid and return to stockpot; stir in flour mixture. Bring to a boil, stirring constantly; cook and stir 2 to 3 minutes or until thickened. 4. Carve roast into thin slices; serve with vegetables and gravy. Garnish with parsley, if desired.